When I said that EVGA has been teasing the Z10 Mechanical Gaming Keyboard for years, I meant it, as Jacob Freeman at EVGA first posted a tweet of the keyboard during Computex 2015. At Computex 2015, Jacob said that the release date of the Z10 Mechanical Gaming Keyboard was to be Fall of 2015, but as that release period passed and time went by, consumers began to wonder when and if the Z10 would be released. 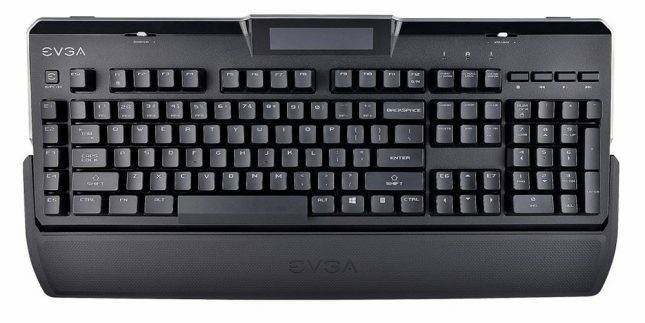 EVGA would continue to show off the Z10 Mechanical Gaming Keyboard at various trade shows, saying it would eventually be available, but never confirming an exact date. 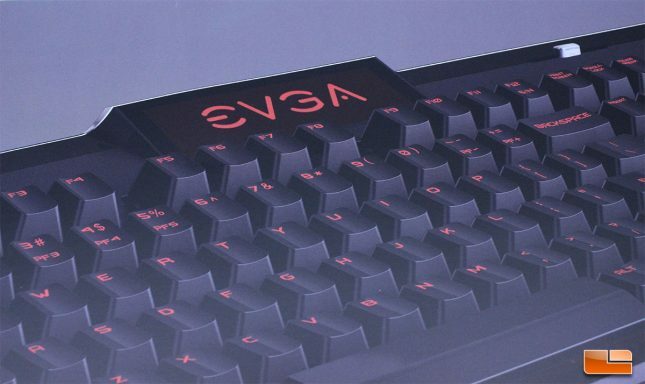 Once a couple of years had gone by, it looked like the EVGA Z10 Mechanical Gaming Keyboard might actually be vaporware, a product that is teased or announced, but never actually produced. When I was told that the Z10 Mechanical Keyboard had been shipped to me for review, I was actually a bit skeptical, but low and behold, EVGA recently put the Z10 Mechanical Gaming Keyboard into production and as of today, it available for consumers to purchase at a retail price of $149.99. The EVGA Z10 Mechanical Gaming Keyboard is an attempt by EVGA to expand their peripheral lineup and give loyal owners of the brand the opportunity to match their peripherals to their other EVGA components. EVGA already manufactures a lineup of mice known as the Torq series and are actually including a free Torq X10 with the purchase of the EVGA Z10 Mechanical Gaming Keyboard from the EVGA website, for a limited time. It is certainly a nice decision by EVGA to add value to the Z10 during this initial phase by including their high end mouse with the keyboard. The EVGA Z10 Mechanical Gaming Keyboard is a large, full sized keyboard built using high quality ABS plastic, which should lend well to long term durability. The most defining characteristic of the EVGA Z10 Mechanical Gaming Keyboard is the LCD screen on the top center of the unit, which reminds me a lot of the classic Logitech G15 keyboard. The small LCD screen on the EVGA Z10 Mechanical Gaming Keyboard is designed to allow users to read information from EVGA Precision X OC, such as current GPU temperature and fan speeds. Basic information such as the time and date are also accessible on the LCD of the EVGA Z10 Mechanical Gaming Keyboard. 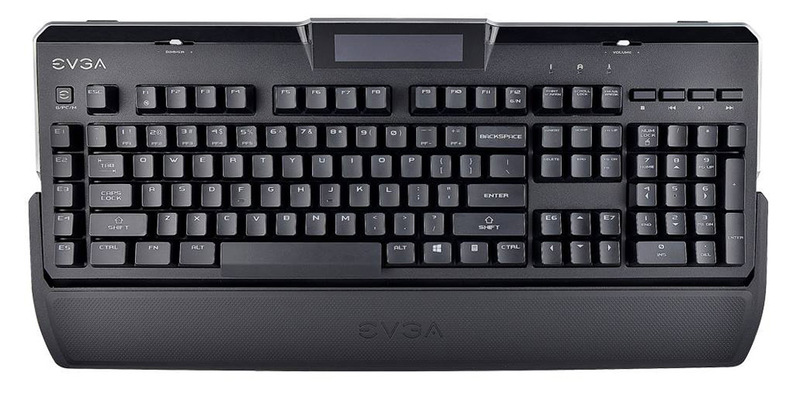 Other features of the EVGA Z10 Mechanical Gaming Keyboard that will be of interest to gamers include a built-in wrist rest, independent media controls and seven glorious programmable macro keys, two of which have been cleverly placed in the arrow key section. Interestingly, EVGA isn’t outfitting their Z10 Mechanical Gaming Keyboard with Cherry MX switches, but have decided to source the switches for the Z10 from Kailh (pronounced just like Kale), producing units with either Kailh Blue or Kailh Brown switches that are rated for 60 million key strokes. Both the Kailh Blue and Kailh Brown switches are Cherry MX Clones that require slightly higher actuation force than their Cherry MX counterparts, but feature similar actuation and travel distances. I do believe the decision to go with Cherry MX clones on the Z10 was made by EVGA years ago, but I do have to question that route on a premium-priced keyboard that is their first to market. Kailh is capable of making a decent quality switch, but they don’t carry the name recognition of Cherry MX and the general market perception is that Kailh switches are just Cherry MX clones, inferior in quality and consistency. My take is that Kailh is making a quality switch nowadays and over the past couple of years, since releasing their new variants of switch to compete with Cherry MX, they’ve improved their quality. Still, with so many keyboards out there featuring genuine Cherry MX switches, the EVGA Z10 might be a hard sell against those units based on the cheaper Kailh switches being used, so thankfully EVGA also has some other features cooked up with the Z10 Mechanical Gaming Keyboard that may interest consumers who are on the fence about the switches being used. It is nice to see that EVGA is backing the Z10 Mechanical Gaming Keyboard with a three year warranty, which is longer than most other manufacturers give, with Corsair and Logitech offering decent two year warranties, while Razer and SteelSeries only offer one year warranties on their keyboards. Keyboards can go bad from defective switches, loose cables or failed circuit boards, so a three year warranty is great to see, especially from a company like EVGA, which is known for providing excellent customer service, based in the United States. The three year warranty of the EVGA Z10 Mechanical Gaming Keyboard should also help alleviate concerns users may have over EVGA using Kailh switches instead of Cherry MX. EVGA has done an excellent job with the packaging for the Z10 Mechanical Gaming Keyboard, their first ever product in this market. An image of the keyboard takes up a majority of the front of the box, with the EVGA logo printed in white on the upper left corner and the Z10 model name printed on the lower left in a clean white font. 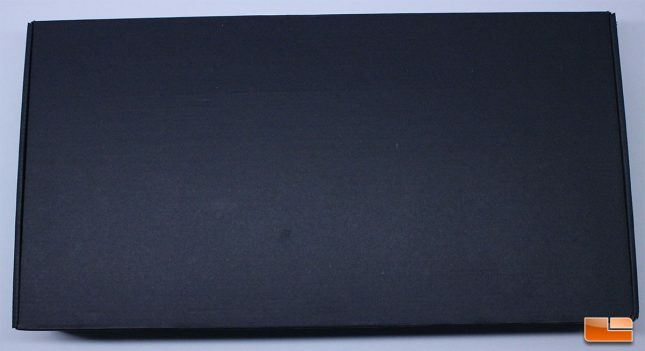 A sticker is placed on the lower front right corner of the box of the EVGA Z10, noting which switch type is being used on the enclosed keyboard. This design lets EVGA easily change the Z10 Mechanical Gaming Keyboard switch types without having to produce different boxes, a method that most manufacturers employ. EVGA shipped our Z10 review sample with Kailh Brown switches, per my request, as the audible click of blue switches isn’t something I will ever be a fan of. I do think the front of the EVGA Z10 Mechanical Gaming Keyboard box can be more informative, EVGA has done a good job of using the keyboard imagery and minimal text to garner attention to the product, as the unique styling and LCD screen of the Z10 Mechanical Gaming Keyboard stand out as unique when positioned next to other keyboard boxes. 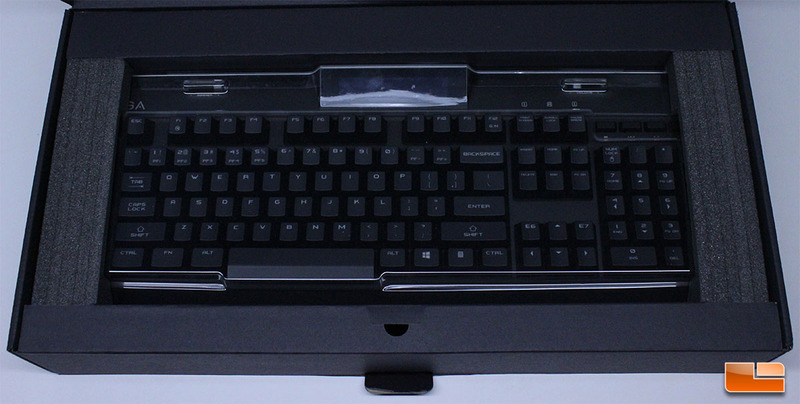 Looking at the rear of the box of the EVGA Z10 Mechanical Gaming Keyboard, we see a lot more information being presented than on the front, but in a clear, easy to read manner. The Kailh switches, USB pass thru, Information Display and Key Cap Puller are highlighted, along with a diagram of the keyboard listing some of the pertinent features and layout of the unit. 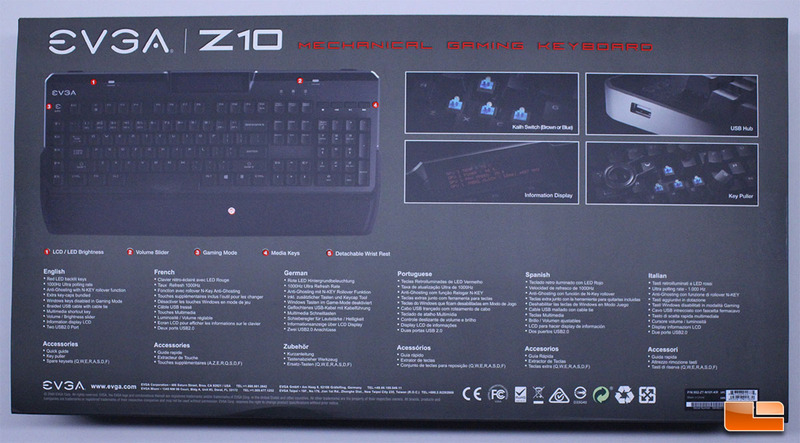 Several features, such as 1000HZ polling and N-Key rollover, are listed in various languages across the bottom rear of the Z10 Mechanical Gaming Keyboard box. Removing the outer sleeve of the EVGA Z10 Mechanical Gaming Keyboard box revealed a thick protective sleeve containing the keyboard. EVGA has been producing video cards for a long time and they definitely know how to package computer components and peripherals properly to avoid shipping damage. Once you open the protective sleeve for the EVGA Z10 Mechanical Gaming Keyboard, you see that EVGA has gone to great lengths to ensure the keyboard arrives undamaged. Foam inserts have been custom fitted and surround the keyboard on both sides, while a thick plastic cover sits on top of the keyboard. At first, it appeared that the LCD may have scratches, but that was actually just glare and imperfections due to the protective film EVGA lined the top of the keyboard and LCD with. Once the EVGA Z10 Mechanical Gaming Keyboard keyboard is removed from the box, you will find the accessories sitting underneath, protected nicely by a plastic bag. EVGA includes extra key caps with the Z10 Mechanical Gaming Keyboard, though they aren’t specially textured or different from the stock key caps from what I can tell. Since the stock key caps are ABS and prone to shine over time, it is nice to have replacements available for the most common keys. There is a plastic key cap puller included with the EVGA Z10 Mechanical Gaming Keyboard, always a nice touch. Thankfully, this puller is completely plastic and shouldn’t scratch key caps as badly as the metal puller I saw in my previously reviewed keyboards. Better yet, EVGA could include a wire puller, as these work best and allow for the easiest removal of keys, as these plastic pullers can have trouble with larger keys and often tend to have issues getting between keys on certain keyboards. Finally, we have a pretty basic instruction manual that most users are going to toss aside, but it is nice to see one included, since I recently reviewed a keyboard that provided a QR code to download a manual. EVGA has done a great job with the packaging and presentation of the Z10 Mechanical Gaming Keyboard. 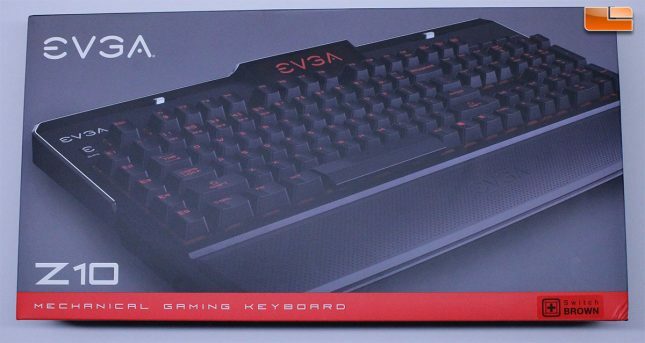 The packaging of the EVGA Z10 Mechanical Gaming Keyboard uses quality materials and the exterior did a good job of giving detailed information on the keyboard. The presentation once opening the keyboard was solid and gave me a feeling that EVGA took their time to ensure the Z10 would arrive to customers unscathed. 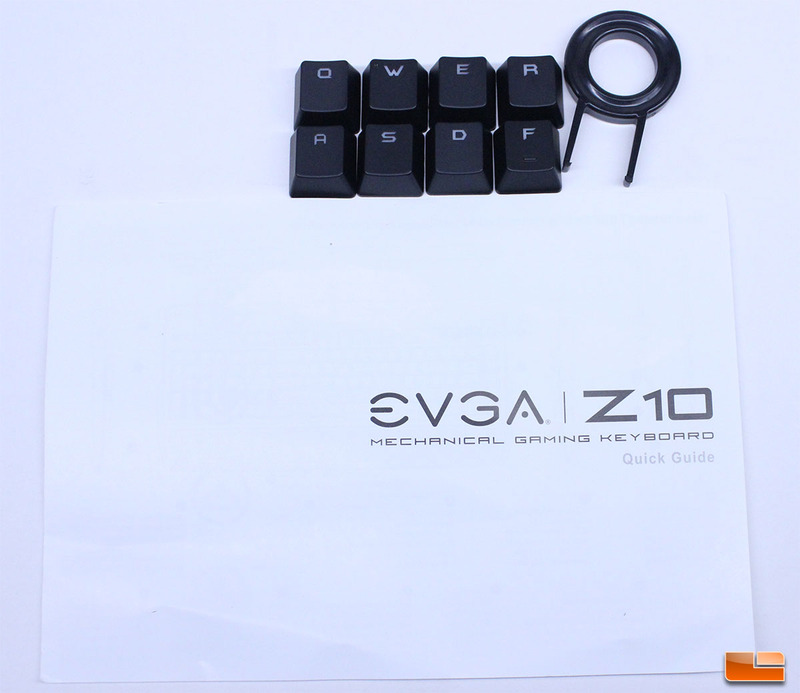 Let’s take a closer look at the EVGA Z10 Mechanical Gaming Keyboard on the next page.